Like all other investments, high-tech appliances require oversight and ongoing maintenance to keep them performing in peak condition. Top restaurants and home chefs choose Sub-Zero refrigerators and freezers because they keep food fresher. 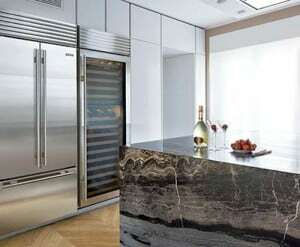 Protect your expensive appliance and its contents by having routine maintenance performed by someone who knows the ins and outs of Sub-Zero repair in Dallas and Fort Worth and throughout North Texas. C&W Appliance Service is the only Sub-Zero and Wolf factory-certified premier partner in North Texas and the company offers repair and routine maintenance on these brands and other appliances in your home. Are you willing to remove vents, drains, tubes and pans? Do you know what you’re looking for and where to find it? Do you know how to get to hard-to-reach equipment on built-in appliances? Do you have the right gauges, thermometers, tubing and other supplies? Can you find the instruction manual? Let C&W Appliance Service handle your routine maintenance or Sub-Zero repair in Dallas and Fort Worth – so you can handle the heavy demands of your life. Schedule your maintenance call for a flat fee of $139.95 for your primary unit and just $30 for any additional refrigeration units serviced on the same call. Call us toll-free at (855) 358-1496. Prevent avoidable break downs and unnecessary Sub-Zero repairs in Dallas and Fort Worth by choosing affordable maintenance plans from C&W Appliance Service.